Is there anything as beautiful as a blood orange? Their gorgeous tart flavor and vibrant red color make them irresistible to me. So irresistible, in fact, that I dragged two kilos home from Tel Aviv (an hour and a half away) just so I could have my way with these seductive fruits. I drank blood orange juice and put it in cocktails. And I made this: blood orange panna cotta. It was so good, and so easy! Bursting with bright citrus flavor, the blood orange dyes the dessert a beautiful shade of pink. It’s the ultimate palate cleanser, and a wonderful end to any meal. The texture is silky smooth but light, and the cardamom-blood orange syrup drizzled over is sensational. Such an elegant flavor combination! I didn’t change the recipe from the original at Bon Appetit, so I’m going to send you over there to take a look. Get the recipe here! I also want to thank everyone for their kind words of support for my cookbook!! If you somehow missed my post and millions of emails, Facebook, and Twitter posts, I hope you’ll read more about it here. Thank you Manu!! Oh how I love blood oranges 🙂 They are hard to find here as well, and only pop up for a very short time. That is one gorgeous plating of blood orange panna cotta! It looks perfect and so tasty! Love the fanned strawberry on top. Congrats on your cookbook!! Your panna cotta is beautiful. I love blood oranges, but they can be very hard to come by around here. Congrats (again!) on your cookbook! 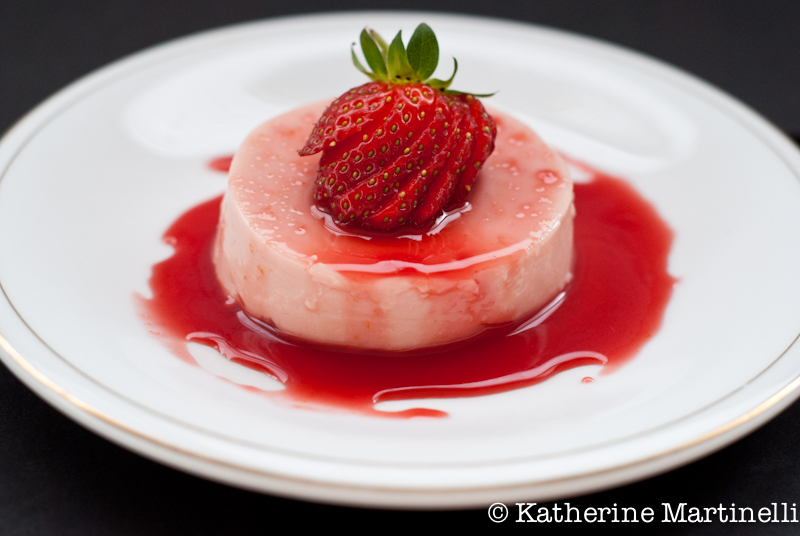 What a gorgeous panna cotta, Katherine! The blood oranges provide such amazing color…yum!! Thanks Liz! I love the color of blood oranges so much! This is soooo pretty! And, looks delicious!!! I think we should have bought some more blood oranges! Aww thanks love! I know. More blood oranges!!! Thank you so much on both counts Tya!! your panna cotta looks wonderful Katherine, I love blood oranges they are so tasty and the juice almost dramatic. It’s funny, just yesterday I upload a citrus recipe, so here it is! What a gorgeous color. Such a gorgeous way to change up panna cotta. Thanks for linking up Lisa! is it possible for you to remove my “mistake” and I’ll add a new one later? sorry…. IT should read Lemon Shortbread Bars! Hi Katherine! This is so beautiful, love the presentation! Your photos are gorgeous as always! hope you have a wonderful weekend! Aw thank you Luciana!! Coming from you that is a huge compliment!! Your panna cotta is gorgeous! I’m passing the recipe on to my panna cotta maker (Bobby). He loves making and eating panna cotta and we both would love this with the citrus cardamom topping. He brought home an eight pound bag of Cara Cara oranges the other (one of my favorites), so I’m on the hunt for recipes. Perfect hop this week for me! Thanks for hosting! Thanks MJ!! I’m sure this would be delicious with any oranges, the blood oranges just give it that pretty color. Cara cars oranges are so delicious. Thank you Pola!! It really does have a lovely citrus flavor. Katherine, your pannacotta looks divine! This looks sooo incredible. Blood oranges are so versatile. I am loving this. Panna cotta is seriously one of my favorite desserts. Right behind creme brulee. I haven’t had it in quite some time though, and seeing your fantastic panna cotta has me craving some! And blood oranges! Ooh you’ve named my other favorite dessert!! I love panna cotta and this one is definitely a winner! What a beautiful panna cotta! Love blood orange, so many wonderful uses. omg cardamom-blood orange syrup, thats a dream come true dessert. Wonderful presentaion too Katherine. Thats absolutly my kind of dish! I have to agree Helene!! It’s such a beautiful flavor combination, and not one I would have thought of. Thank you!! What a great blog hop idea! Absolutely beautiful Katherine. Definitely a favorite. Have a great weekend. Wow! This does look gorgeous and very tempting. I can distinctly imagine the flavours on my palate! Thank you! It has lovely bright citrus flavors. Oh, that colour is stunning. Just beautiful. I love blood oranges… that subtle hint of raspberry. Thanks Lizzy!! I know, I’m such a sucker for blood oranges mostly for that stunning color. And as a post script… WOW! to all the entries in the blog. Citrus-ificent! Seriously – I was blown away by all the entries!! Thank you Jessica!! And thanks for the book congrats. I would absolutely love to talk with you about it for the group! I’ll shoot you an email 🙂 Sorry for my late reply, I’ve been catching up on comments, etc. all week! Gorgeous – I love blood oranges, and your panna cotta looks perfect 🙂 Pretty and delicious! A beautiful dish! Believe it or not I’ve never had a blood orange. Must remedy this. You’re making me jealous talking about two kilos of blood oranges! It’s always a special treat when I happen to find good ones. Pretty pictures! And sounds like a nice recipe – I’ll have to take a look at the Bon Appetit link. It’s funny, I subscribe, but I’ll bet I have most of the last 2 or 3 year’s worth of issues still in their little plastic shipping bags. It used to be a great magazine, but over the last decade it’s declined. And the page design is so annoying! Half the time I can’t distinguish the ads from the actual content. But I know it has a new editor and I’ve heard enough positive things about changes that I flipped through a couple of recent issues – things are looking up. Anyway, thanks for this. Thanks! It’s really a lovely recipe, and so easy to make. I know what you mean about the magazine. I’ve been a longtime subscriber and always enjoy it, but it’s definitely had its ups and downs. I do like the direction that Adam Rappaport has taken the magazine in. This looks so good! I love panna cotta and just made some with creme fraiche, topped with strawberry mousse and puree and it was so delicious. Can’t wait to try this one with the greek yogurt and the blood oranges! What a pretty blog you have! And what a stunning dessert! Oh my goodness this looks amazing!! I love blood oranges, the color is just incredible in these photos. I’m sure it makes a perfect mixer for cocktails also! This sounds spectacular & looks extremely elegant! YUM! Thanks Lacy!! I also love blood oranges. They’re just so gorgeous! You made me smile imagining you were bringing 2 kg of blood oranges home. Now that’s serious addiction. 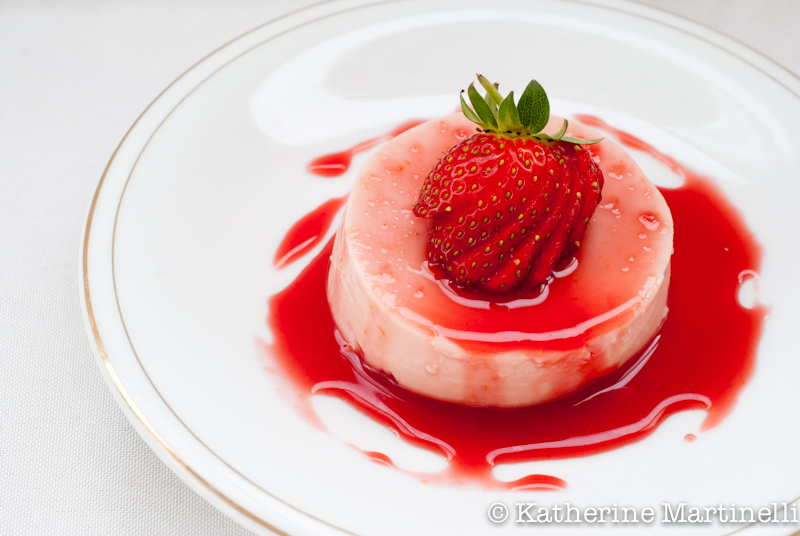 =) It’s a great idea to make panna cotta with blood orange – this is insanely beautiful Katherine! I love the color and it’s very appetizing! Haha I know Nami! Serious addiction 🙂 Thanks so much!! A perfect ending! Colorful, light and so fresh tasting. Wow, this panna cotta looks awesome…love the contrast of the blood orange. beautiful pictures Katherine!